My parents would never dream of embracing the technology I use every day. They remember innovations such as color TV and push button phones. On the other hand, my adult children are comfortable with Skype and Instagram, and they would rather text than make a phone call. I fall somewhere in between. I couldn’t live without my email and Facebook, and I really enjoy blogging. As a teacher, I use a Smartboard and document camera every day. As an author, I am often on Goodreads and Amazon. I’m not sure technology has improved the quality of life for three generations of my family, but it is definitely fun. Most of the time! 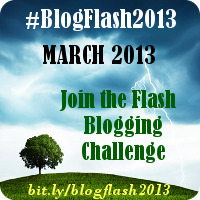 For more of my March BlogFlash posts, click here. I do wonder how soon it will be before the latest gadgets come out and I’m scratching my head trying to figure them out. I can just about keep up at the moment at least!